What is the faucet style and manufacturer? Also what is the countertop - What is the faucet style and manufacturer? Also what is the coiuntertop? What is the granite used for the dountertops? $? - What is the total price of this remodel? I'm sure it says in the article, but don't know where. Thanks! As the cabinetry designer I was only involved in the budget of the cabinetry. Total project was probably around 25k-30k. Cabinets - What is the brand and color of the cabinets? Thank you for your inquiry. These cabinets are manufactured by our company, Kitchen Depot. The door style is "Newport Alder" and the color is "Cocoabala". Measurements - What are the dimensions of the cabinetry from end to end, top to bottom, and depth? Thank you for your inquiry. Cabinets are wall to wall (150") , height is 93" with the crown and depth is 25" at the deepest point. Floor tile - Love the floor tile and pattern. Do you know the manufacturer and name? Is it porcelain? Thanks. does the overhead part make it too crowded? 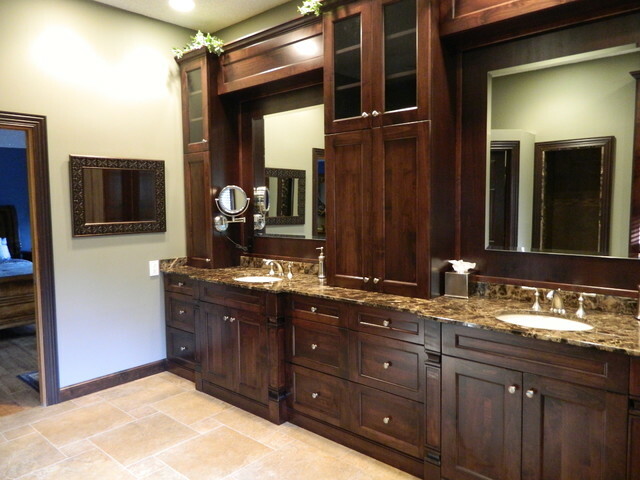 Here, bath cabinetry goes wonderfully over-the-top and takes advantage of high ceilings.